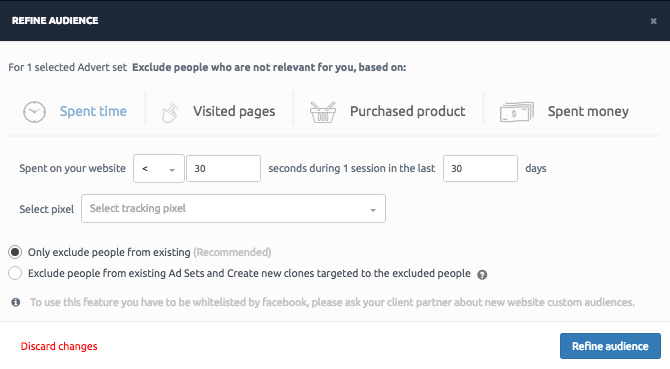 TL;DR Facebook is introducing new attribution window options to help you optimize your campaigns for higher returns. We got to test the new attribution potion first and lived to share the ingredients we found to work best. Conversion tracking helps point out ads that led users to website conversions. An attribution window refers to the time period that would pass between a user viewing or clicking a Facebook ad and that same user converting (purchasing or signing up) on an advertiser’s website. Conversions can be attributed either to user clicks-throughs or to views with the 28 days maximum conversion window. Facebook does not consider conversions that take place after the 28-day period. Of course the attribution rules for Facebook and Google also impact how your ROI and campaign planning. From June 21st you are able to pick either 1- or 7-day attribution windows for different campaigns when creating your new ad sets in ROI Hunter. How can different attribution windows improve my ROI? The longer attribution window model vs. the current 1-day model has to have the ratio of 1-day post-click conversions to 7-day post-click conversions on the optimized pixel or pixel event of 0.7 or less in order to make a difference. You can check this ratio by looking at Facebook Ad reporting for an existing ad account. If the ratio of 1d/7d post-click conversions is 0.9 or more (with the vast majority of conversions happening within 1-day post-click), the new model will likely perform similarly to the current 1-day model and there is no need to switch. We have run several experiments and the data so far shows different results depending on the amount of time campaigns were active for. For the split tests of attribution windows we left the rest identical and targeted both ad sets at 16,000-large audiences. 1-day attribution outperforms 7-day throughout the first two weeks in terms of both transactions and revenues. By week 3, however, 7-day attribution surpasses 1-day for transactions and gets close to leveling out with 1-day in terms of revenues. As 7-day attribution has faster growth metrics and doubles revenues every week for the first 3 weeks, it can potentially outperform 1-day window for campaigns running for over 2 weeks. 1-day window has lower costs of sales throughout the duration of the campaign. Marketers have to bear in mind the planned length of their campaigns prior to picking attribution window settings to stay ahead of the crowd. For short-term campaigns running for under 2 weeks 1-day attribution window is the clear conversion winner. For campaigns longer than 2 weeks, we suggest initially setting up two separate ad sets with the same settings, creatives and audience, but different attribution windows. If after 2 to 3 weeks one of the ad sets starts performing better than the other – turn the 1-day attribution window off, switching to 7-day-only-mode without interrupting your campaigns. If both continue to perform equally well, keep both ad sets running targeting the same audience and converting users in tandem. This development further enhances advertisers’ approach to marketing to customers on different levels of the acquisition funnel. While the end goal of acquiring conversions remains paramount, the shorter conversion window will allow you to get more precise with creatives, displaying specific new and short-term deals through the 1-day attribution placing, whilst running your seasonal ads with the 7-day option. To further enhance the process of moving potential customers from Facebook to website conversions, we recommend refining your audience as a part of your campaign optimization process – by excluding qualified bounce traffic from your 7-day attribution re-marketing campaigns, you would be able to reach the perfect equilibrium, pointing out potential customers and placing your ad budgets in the right basket. As 7-day attribution has faster growth metrics and doubles revenues every week for the first 3 weeks, it can potentially outperform 1-day window for campaigns running for over 2 weeks.